This post is sponsored by Barilla. We teamed up to introduce you to their new line of one-ingredient legume pastas made from chickpeas or red lentils. 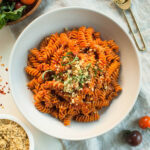 If you love pasta, and you love getting the most nutrition out of every meal, then you’re going to love their new legume pastas, and this delicious vegan pasta puttanesca! There are so many reasons to love vegan pasta puttanesca. 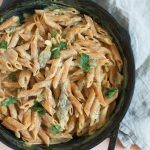 I love this tasty pasta dish for its pungent flavors, its ease of preparation, and because you can make it with simple pantry ingredients. 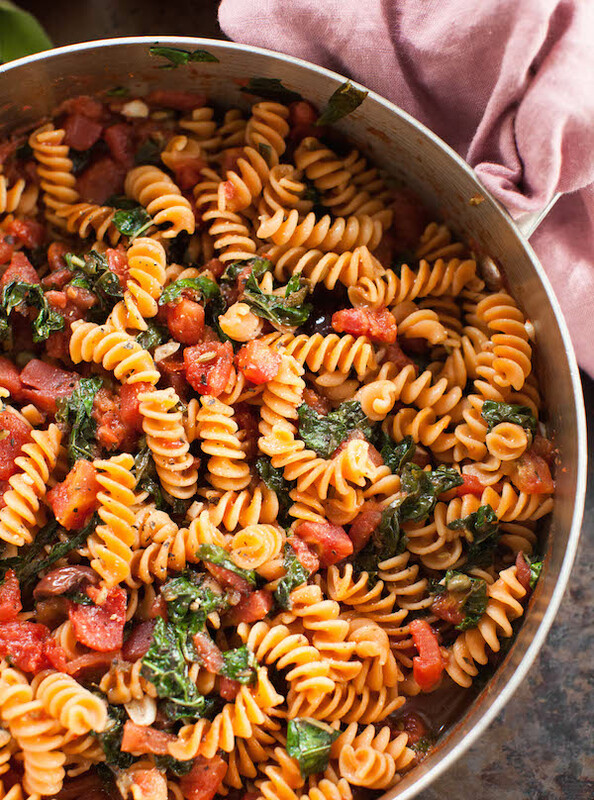 I always keep olives, capers, and diced tomatoes in my cupboard for when I’m craving this dish. If you like pungent olives and capers, then you’ll love this simple vegan pasta puttanesca! Non-vegan versions add anchovies to the sauce, but I like to add a little dulse seaweed, which is briny and tastes like the ocean. This is the sort of recipe that you can throw together quickly on a weekday night, make for your weekly meal prep, or prepare for dinner guests. 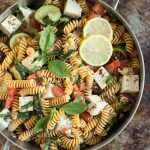 The fact that you can dress it up (serve it to dinner guests with Italian white wine, bread, and a fancy salad) or dress it down (take it to work in a reusable container) makes it a winner in my book. Traditionally, pasta puttanesca is made with spaghetti, but I’ve enjoyed swapping out the wheat based spaghetti for the legume pasta from Barilla. 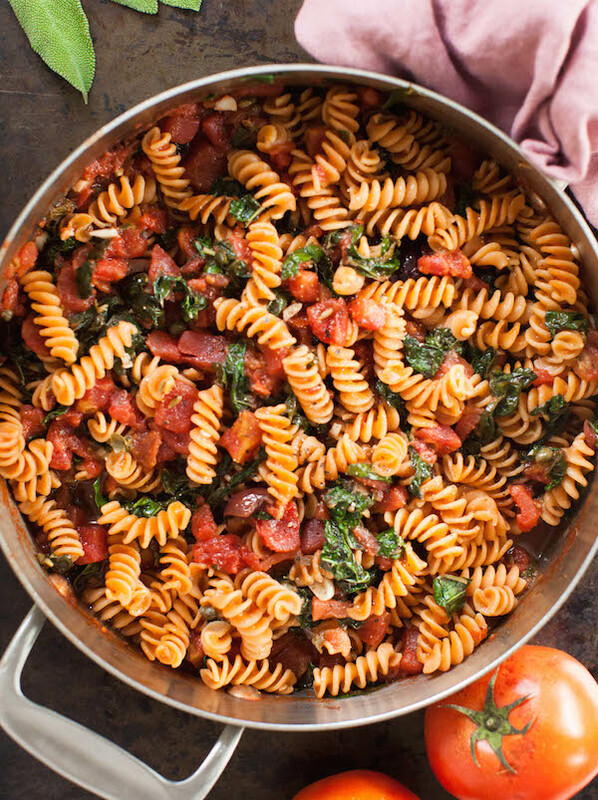 For this recipe, I used their Red Lentil Rotini and my pasta puttanesca turned out brilliantly! 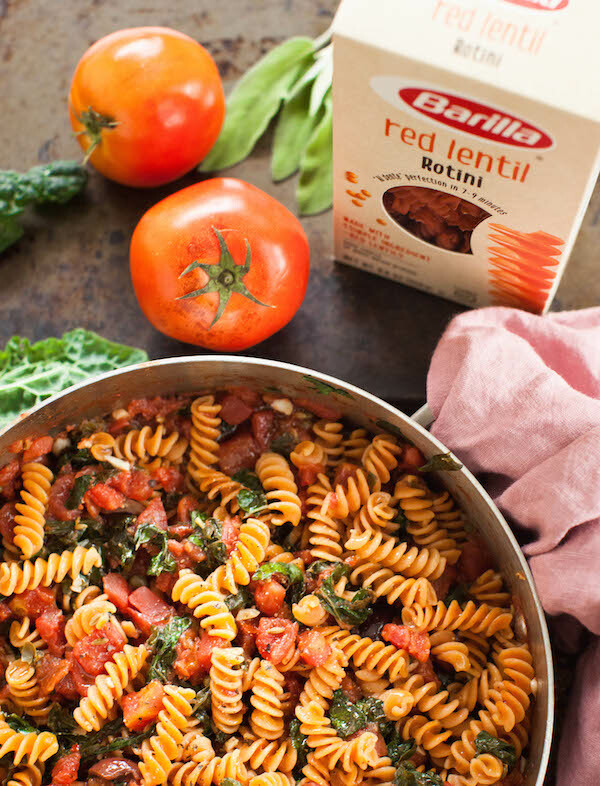 All of the new legume pastas from Barilla are made with just one ingredient: either red lentils or chickpeas. That means that they contain all of the good stuff found in legumes: fiber, protein, b vitamins, iron, potassium, zinc, magnesium, and more. Add a dark leafy green like kale to the sauce as it cooks, and you’ve got a truly well-rounded dish. 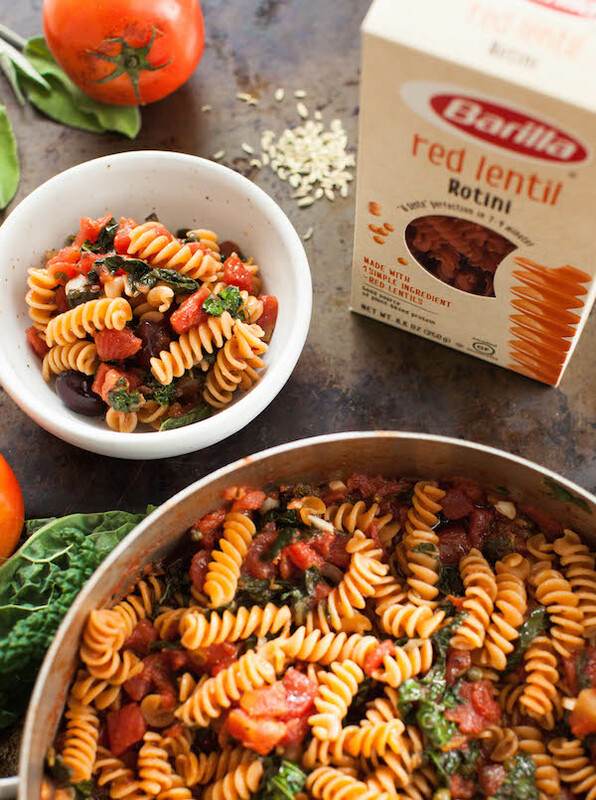 You can find the Barilla Legume pasta on Amazon, and at select grocery stores nationwide. The pastas come in four varieties: Chickpea Rotini, Chickpea Casarecce, Red Lentil Penne, and Red Lentil Rotini. Have fun exploring them all and keep returning to my blog for more recipe ideas! For more on the new pastas from Barilla, visit www.barilla.com/legume. 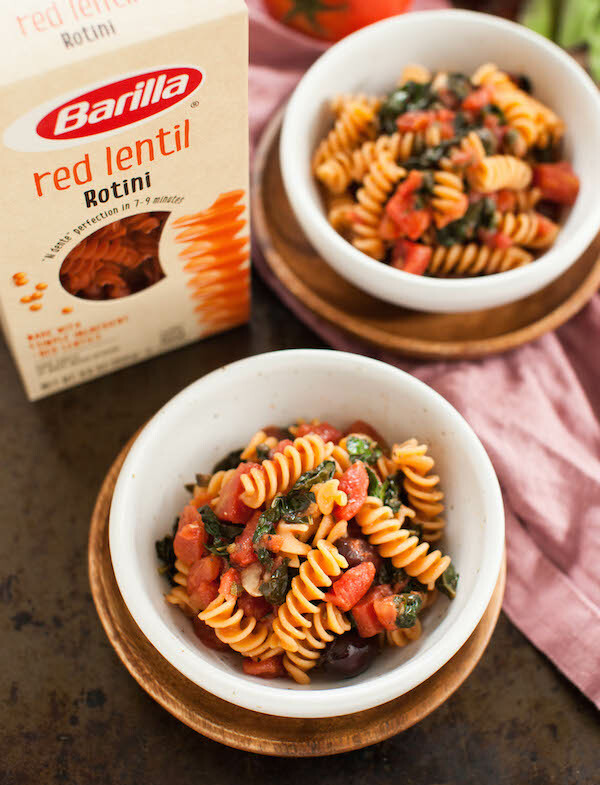 Check out these other recipes I created using the Barilla Legume pasta: Eggplant Red Lentil Penne Pasta, Mediterranean Pasta Salad, Oyster Mushroom Red Lentil Pasta Alfredo, Spicy Pasta Arrabbiata. In a large skillet warm the grapeseed oil over medium-low heat. Add the garlic, and sauté until slightly golden. Be careful not to burn it. Add the wine, and simmer for a minute. Add the tomatoes, olives, capers, dulse, sage, fennel, oregano, thyme, and chili flakes. Bring to a simmer, then reduce the heat and let it cook for about 15 minutes. To make the pasta: boil 4 quarts of salted water, add pasta and boil for 6-7 minutes for al dente (I add 2 more minutes when cooking the Red Lentil Rotini because I like a softer pasta). Drain well, then toss immediately with a drizzle of extra virgin olive oil in the colander. Add the kale, tarragon, and basil to the puttanesca sauce, and stir well. Cook for 5 more minutes. Season to taste with more dulse if you’d like it saltier. Add the pasta to the sauce and toss well. Serve warm.